The beach is an undeniably romantic wedding venue.A beach at sunset can be so beautiful it can move you to tears, and there is something poetic about how the sea and the sky meet. As you say your vows and glance at the horizon, you know that you and the person you are pledging your life to will travel together to pursue shared dreams and meet future challenges. The beach allows greater flexibility in wedding themes and tones. If you hold your wedding in a high-ceiling cathedral, you will be more or less bound to a formal wedding. If you are not the type to be happy with conservative ceremonies and receptions, a garden or the beach would be perfect for you. You can be as formal or as informal as you like when you say your vows at the beach, and you can actually pick just about any motif or theme to create the wedding you have always wanted. Beach receptions allow you to accommodate more guests at a lower cost. You have to face the fact that after spending for engagement rings, wedding rings, and setting aside money for a wedding trip, the wedding reception is a major financial undertaking for most couples. With the prohibitive “per cover” cost of hotel receptions, engaged couples often have to pare down their guest list even if it means excluding people they really want to invite. 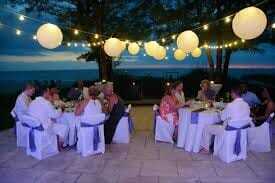 Beach receptions allow couples to invite more people for less money. With a caterer, rented chairs and a creative organizer, the reception could very well cost only half as much per person. With the savings you can make, you might even be able to go for a pear shaped diamond or some other fancy stone for your engagement ring. 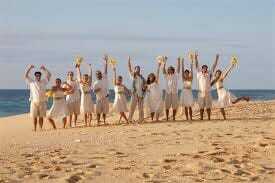 Beach weddings are more fun. If you can set up space for dancing and singing, beach parties often allow people to be less stodgy. People at the beach are bound to have more fun just being themselves and mingling informally. Indeed, beaches are wonderful settings for weddings but a perfect event will require more than having the sand, the sea, and the sky as your background. A quick reality check will remind you that beaches are windy places, and the sand beneath your feet won’t always behave as you wish it would. Furthermore, a beach wedding at dusk can mean uncomfortably cold breezes, while a morning wedding with a lunch reception could mean sweltering heat. This means there are some things you need to plan for if you want to make sure everything goes without a hitch. Be sure to pick the right outfit. The beach is not the place for an overly flouncy ball gown. Neither is it the place for a slinky pencil-cut, serpentine skirt. As a rule, these are the clothing types that are incompatible with windy, sandy. beach weddings: long veils and trains, lace trim, fragile silk, brocade, or fabrics easily damaged by debris. The better choice would be cotton, chiffon, or organza – textiles you can easily shake sand from. You can have a wedding ring as fancy as you like on your wedding day, but your dress will have to be rather a bit less regal and more practical than the usual bridal gown. Free the groom and his men from the tux. A tuxedo will be difficult to wear on the beach. Why not allow your partner to shed the warm clothing and pick something more appropriate? An Indian sherwani (a long loose coat made of summer linen) or a Nehru type jacket made of lighter material will still look dignified but will be easier to wear. Revise the veil. Rethink the image of a long tulle veil that the bridegroom will lift to expose your lovely face. Unless you can command the winds to stay still the whole time, that lovely picture will not become a reality. Settle for a well-fastened hat with a short veil, or a shoulder-length one secured by flowers on your hair. Make sure you can ditch all the clingy, floating parts of your headgear once the reception starts so you can circulate in comfort. Get an appropriate hairdo. Long flowing hair while sauntering on the beach looks very romantic but you are going to have trouble keeping it out of your face throughout the day. The best way to do your hair is to have it up. If you think a chignon or a French twist is too harsh for your features, try a Gibson girl topknot with a few tendrils down your nape. Invest in the services of an expert hairstylist so you can be both gorgeous and fresh looking throughout your wedding day. The good news is that the styles for hair today are as varied as the styles for diamond rings today, and you will surely find something to suit your taste. Forego the heels. One of the things you may have to give up for your beach reception is the pair of high heels that you always took for granted you would wear. You might still be able to put them on for your march down the center aisle, if there is a bridal carpet with a stable enough walkway beneath it. 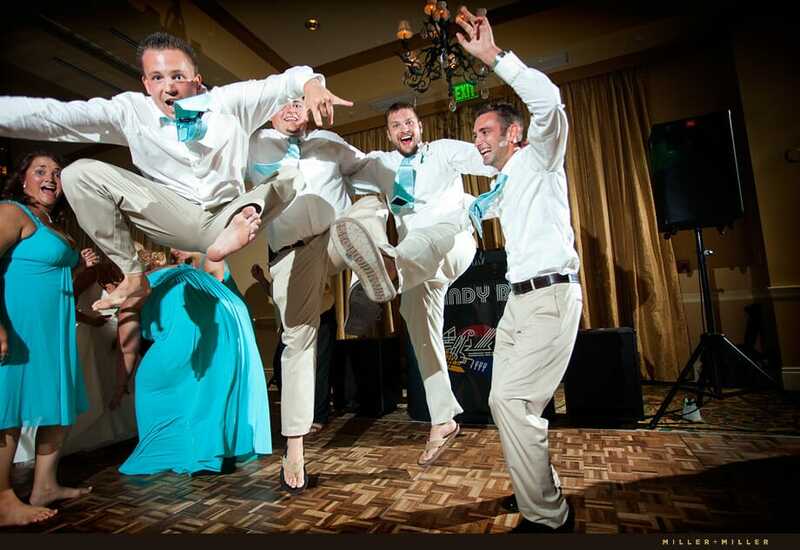 However, when you dance or circulate among your guests, heels are impractical because they will certainly sink into the sand. Put on some satin flats or a pair of made to order bridal flip-flops instead. Don’t feel so bad about surrendering your stilettos; if you need some consolation, remember that after the ceremony, you won’t ever have to surrender your diamond ring except to have it resized. Make things easy for your guests. Give your guests the information they need, including what clothes they should wear. Prepare a station with several tubes of sun block, sandals and flip flops – in case some people come with inconvenient footwear. One thoughtful couple included footwear when they mailed their invitations, while another filled up half a dozen umbrella and hat racks as part of their décor. Each seat had a bottle of water and a fan to make sure guests were comfortable. These little acts of thoughtfulness will go a long way towards making your wedding an incredibly successful event because your guests will feel cherished. Check out what the beach provides. There are certain things you will need when you hold the most important event of your life. Find out if the beach you are thinking of as your wedding venue will allow you some privacy. Make sure there won’t be any half-naked bathers running around while your minister pronounces you husband and wife. Will you be allowed to put up a canopy or an arch for a backdrop against which you will say your vows? Ask if you will be allowed to arrange chairs or set up a dancing area. You will of course need a center aisle to march on, so find out about that too. Manage the environment. As you prepare for your wedding, keep the environment in mind and devise ways to manage it well. For example, make sure your wedding ceremony ends an hour before dusk so you get all the important pictures at the time when the light is good. Make sure all your décor is well secured, and nothing will get blown by the wind. Provide a good canopy for guests in case the sun gets too harsh, and make sure there is shelter nearby in case it rains. Keep the ceremony short, sweet, and totally audible. Weddings on the beach are not meant to be long-drawn rites. Work with your minister or priest to come up with a truly meaningful but brief ceremony; and make sure your voices are clearly heard by your guests. If you need to, rent some wireless microphones to make sure people know what is going on. Make provisions for keeping valuables safe. Make sure you have a person assigned to receive valuables such as watches and wedding rings if people decide to swim after the wedding dinner. Remind people that if they drop jewellery in the water or the sand, these can be nearly impossible to recover, especially since the diamond colour in most pieces will just blend with the colors of the sand and the water. A beach wedding can be the very stuff dreams are made of, and there are wedding consultants who specialize in creating amazing ceremonies and receptions in this setting. If you think the beach is the right location for your special day, go for it. 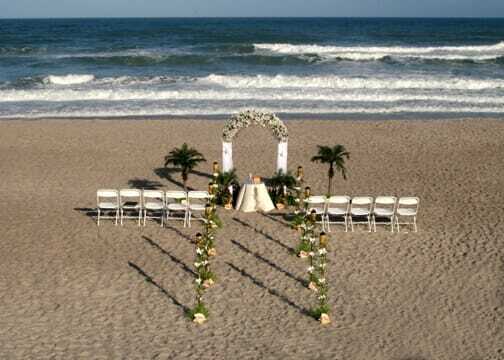 With a little careful planning, your beach wedding will be a memory to cherish for the rest of your lives.